Okonomiyaki Restaurants in Osaka always have many variations of Okonomiyaki to choose from. One popular variation is Ebi Okonomiyaki (Ebi means prawns/shrimp). 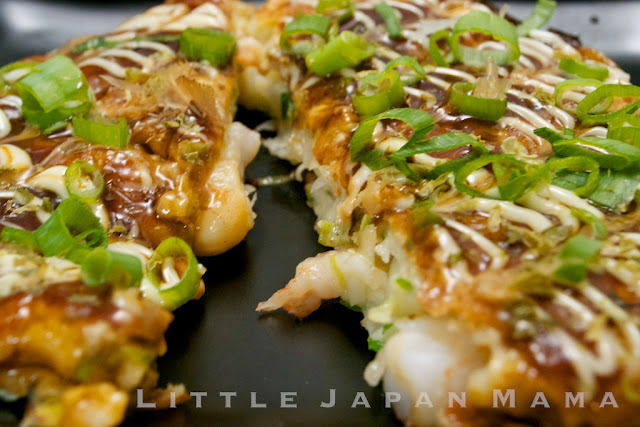 As our family loves both prawns and okonomiyaki, this is also a favorite on our dinner menu. 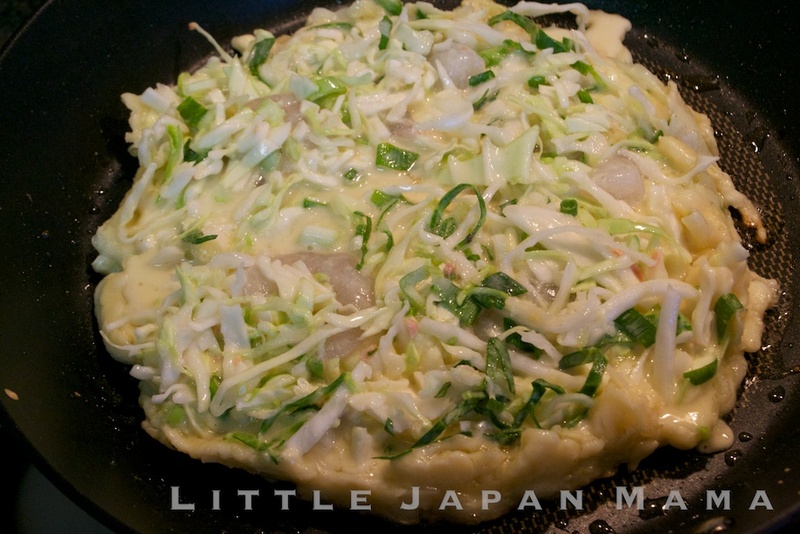 If you have a teppanyaki plate, cook this at the table, serving on the teppanyaki plate to keep the okonomiyaki hot. Each person then places a portion on their small plate (torizara) to eat. Mix flour, water, eggs in a large mixing bowl. Mix in dashi, pickled ginger and negi. Add cabbage and combine well. Heat a little oil in a frypan. 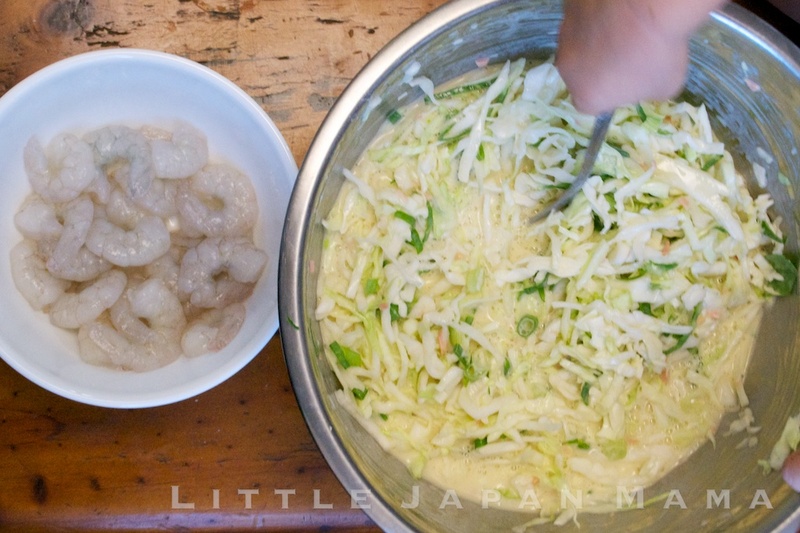 Spoon Cabbage/prawn mixture into the frypan, to make a circle about 22cm(9in) across and 1.5cm(3/4in) thick. Make sure there's enough batter to hold it together. 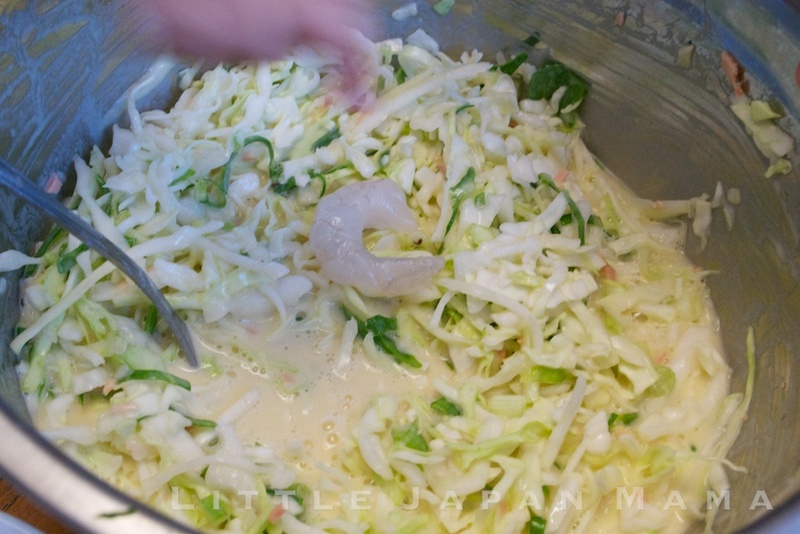 Neaten the edges by using a spatula to push in the edges and any cabbage or batter that's sticking out. Cook over med-low heat about 5 min. Flip, then cook another 3-5 min. When cooked through, turn onto a plate. Spread sauce generously on top. Decorate with Mayonnaise and your choice of Negi, Katsuobushi and Ao-nori. 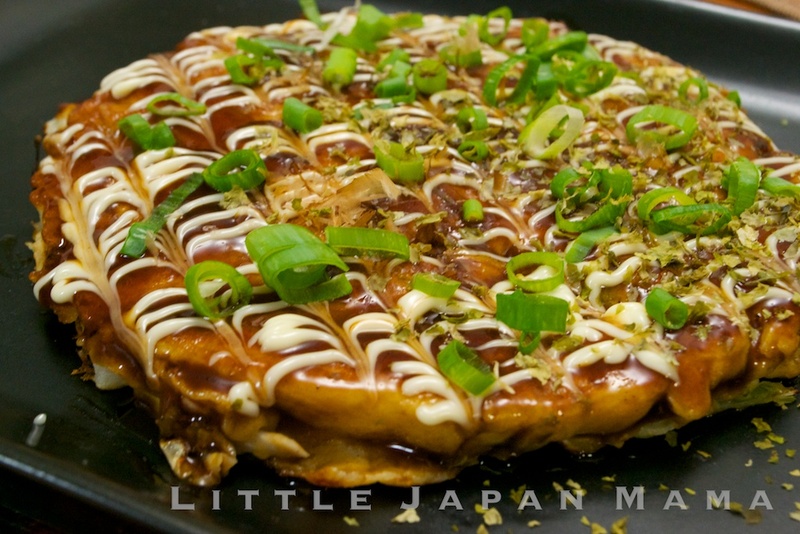 your pictures are making me drool :P i love okonomiyaki. i will definitely try this! Mmm, yummy! Can't wait to try your recipe. I am making you recipe right now and love it with prawns! Thanks! I come to your blog by chance and I would like to compliment you for all the great postings. I am yet to try your recipes but the pictures look so good & I believe the food taste like heaven too. Thanks a lot & continue the great work. Perfect Takoyaki, from Plain Flour! Like to Win Japan Giveaway: Obentou box, Sushi rolling mat, Miso Soup Bowls and Japanese Ingredients! 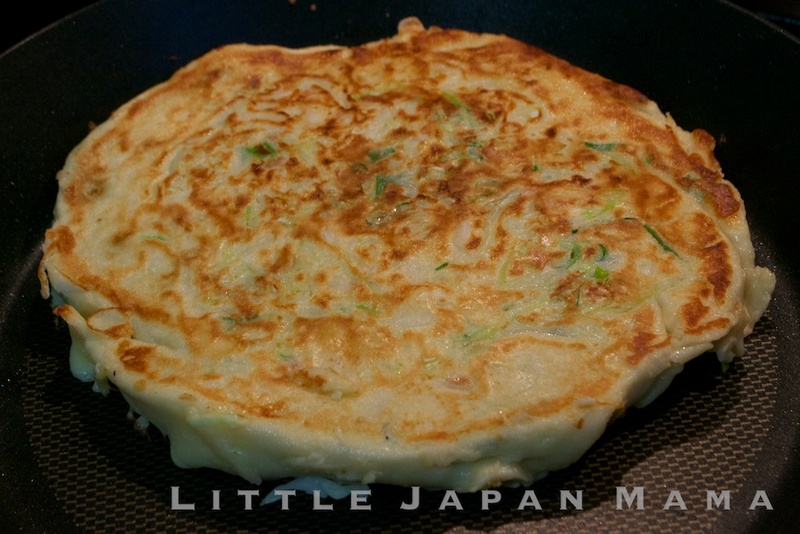 All images and content copyright © 2011 Little Japan Mama. Theme images by merrymoonmary. Powered by Blogger.